Decaf. Mint Green (China) - 4 oz. 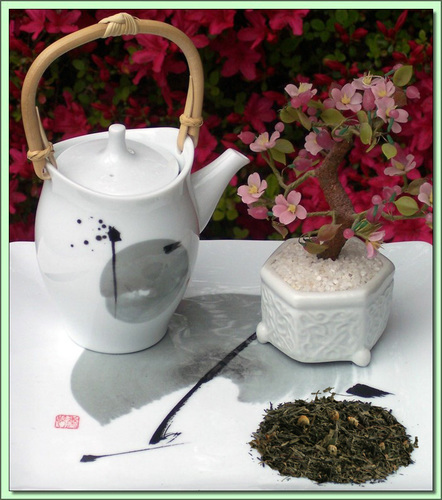 Character: The goodness of green tea without caffeine, longish sencha leaf style. This decaf Sencha style green tea was grown and produced in China's Hunan Province. The exceptional leaf is decaffeinated using a patented Chemical Free CO2 process. During the process, naturally occurring CO2 is circulated under high pressure to extract caffeine. Not only is this process completely chemical free and kind to the environment, it leaves none of the chemical flavor residue associated with chemically decaffeinated teas. The light, fresh taste that is the result makes this tea a natural for blending with dried fruits and herbs, and it retains 95% of its polyphenol potency. This Okazaki Mint blend begins with a premium decaffeinated Sencha that's fired up with luscious spicy peppermint and mellowed out with fruity floral notes of camomile. An exceptional decaf full of flavor and body. Ingredients: Co2 Decaffeinated green tea, Peppermint leaves, Camomile Blossoms. Hot Tea: This tea is best enjoyed by pouring 180F/90C water over the leaves (1 teaspoons) for 3 minutes (longer=stronger). Don't remove the leaves. Can be infused repeatedly 2-3 times using higher temperatures & shorter infusions until flavor is exhausted.